The snow has finally gone! Hopefully this means spring is on it’s way. 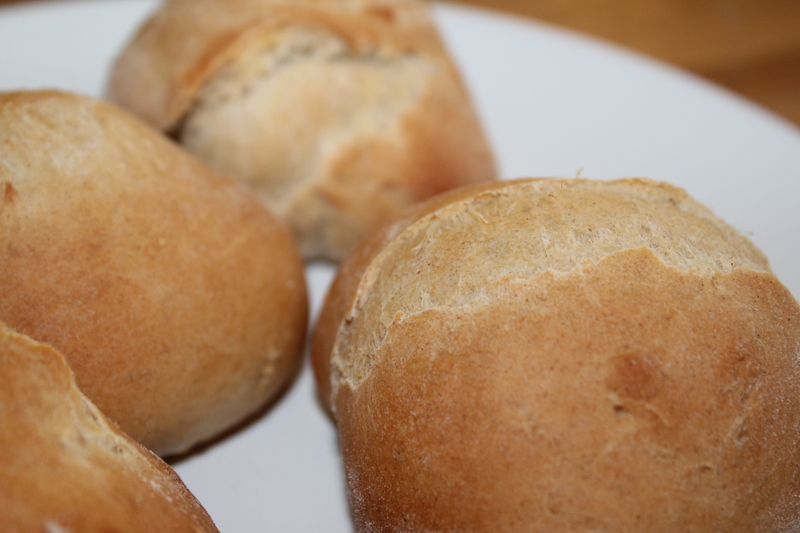 To celebrate I thought I’d make some bread as the sun was shining and the smell of freshly baked bread filling the kitchen just seemed appropriate. 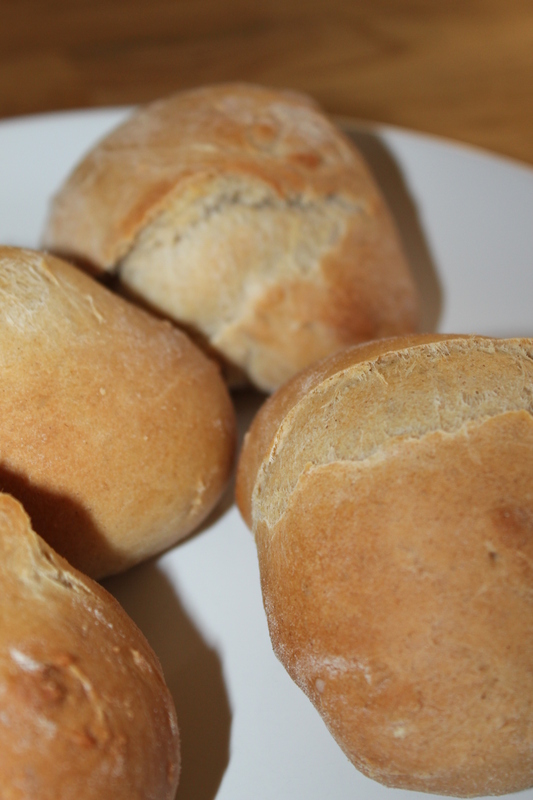 If you’ve never made bread before you should as it’s surprisingly simple and there aren’t many ingredients you knead (see what I did there!). 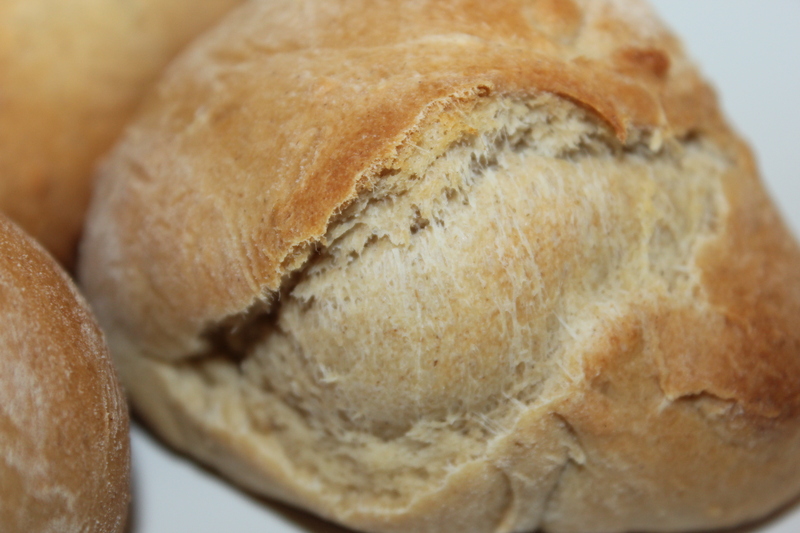 Kneading the bread is really therapeutic and relaxing. Make sure you really get stuck in and don’t be afraid to get your hands doughy. Even in the beginning stages the smell is just so cosy and homely. 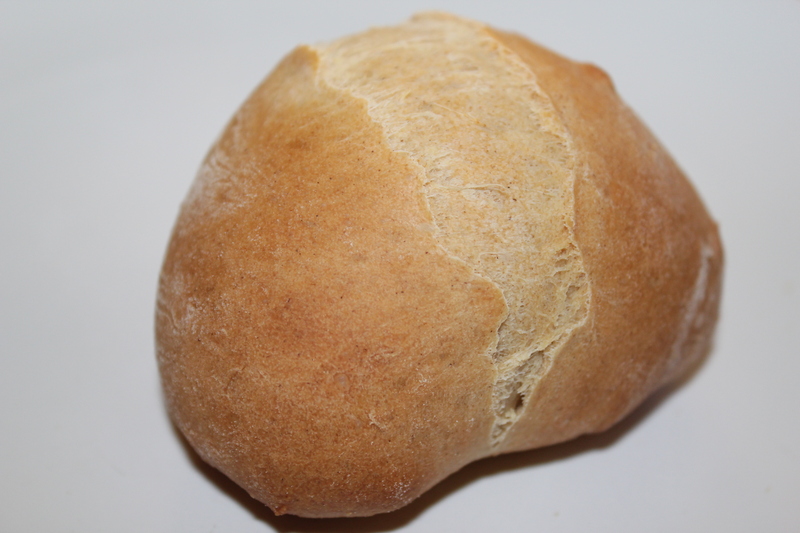 I think it’s because of the stronger flour which is used in bread baking. And, I know this is cliched, but the smell which fills the kitchen is just mouth watering. Eat straight out of the oven with butter, cheese and fresh tomatoes. The butter and cheese melt straight away and it just one of those small pleasures of life! 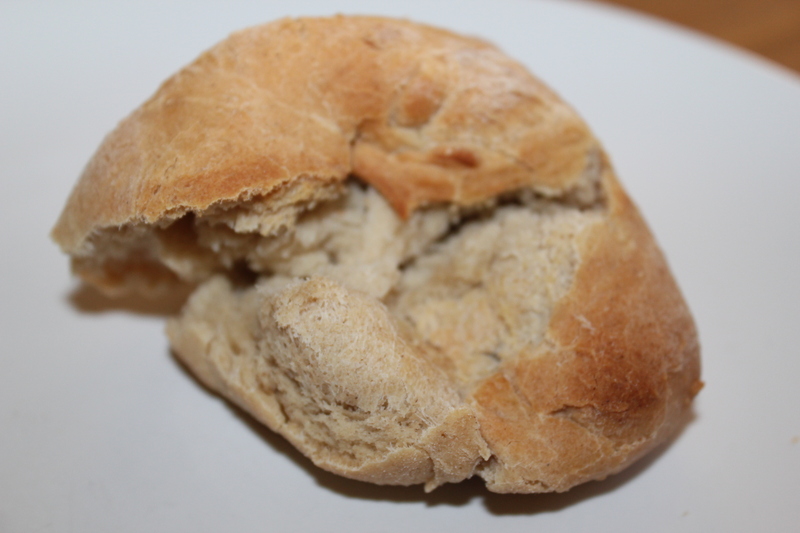 The inside is soft and light which contrasts with the crisp crust. There is a faint taste of olive oil which is delicious. Each one comes out an individual shape! Sift the flour into a bowl with the salt on one side and the yeast on another. Make a well in the middle and pour in the water and olive oil. 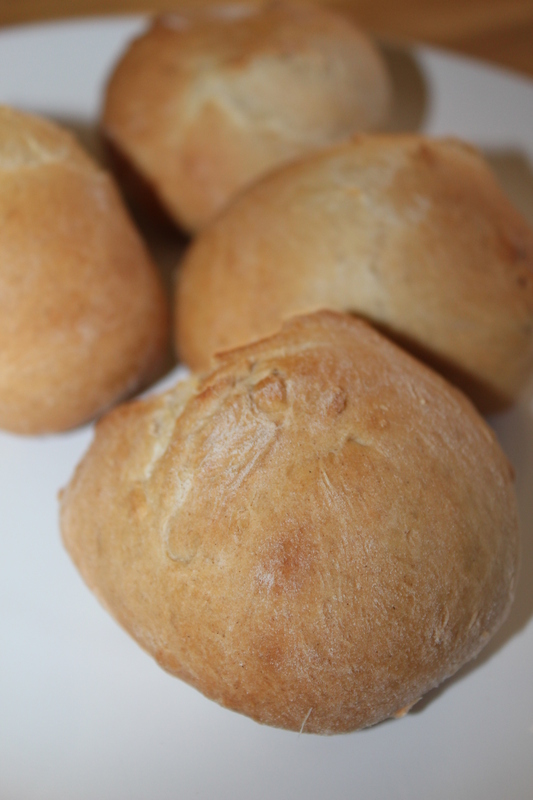 Using your hands mix everything together then start to knead in the bowl until a ball is formed. 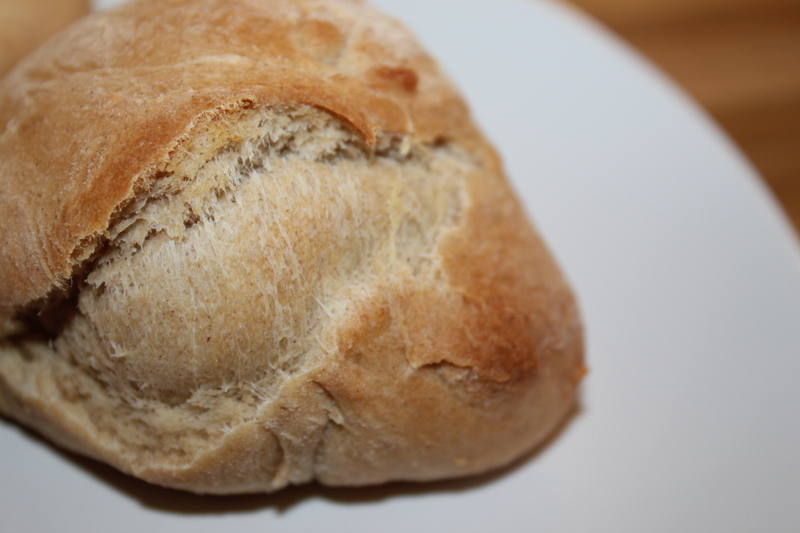 Flour your work surface and knead the dough, pushing it away from you then bringing it back, for about 10-15 minutes. Pour about 1 1/2tsp of olive oil into a bowl and spread it around the edges. 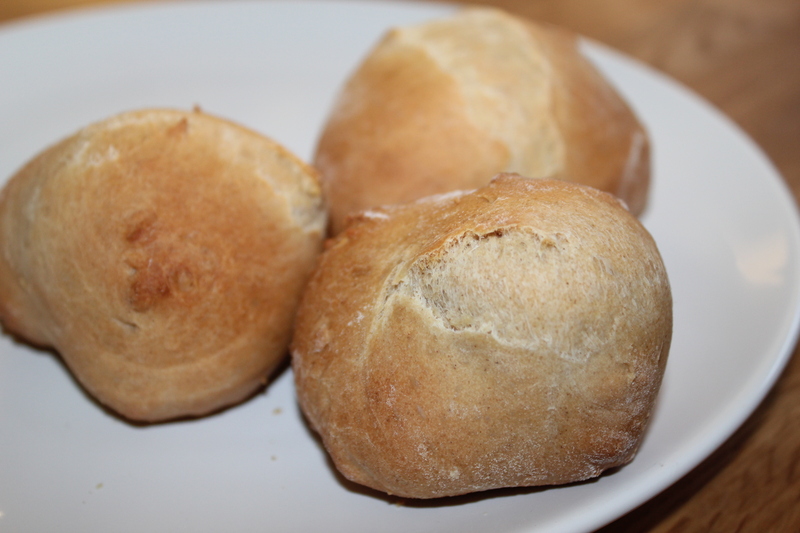 Put the dough in the middle, place a tea towel over the top and put in a cool, dry place. One hour later take it out a knead for about 3 minutes. Then, place back in the bowl with the tea towel over the top and leave to rise for another hour in a cool, dry place. After this final rising, knead for 2-3 minutes then flour your hands (to stop the dough sticking from your hands). Break into 12 pieces and roll into a ball. 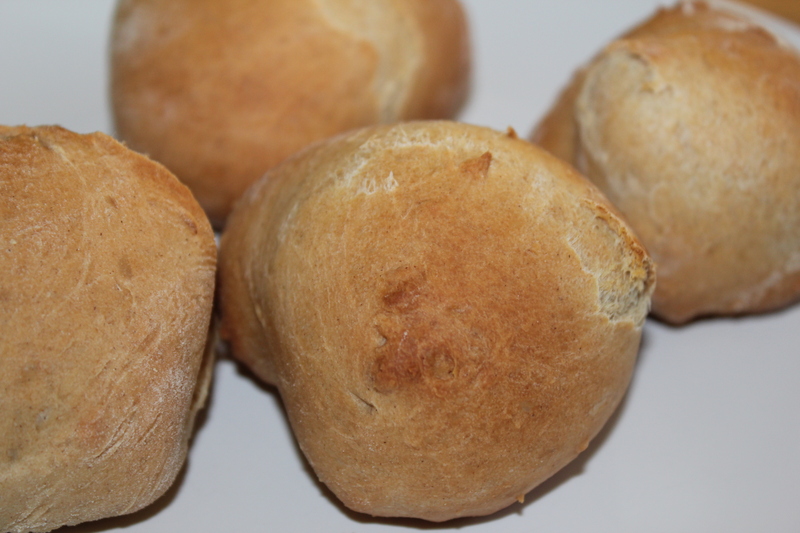 Put in the oven for 25 minutes or they rolls are golden brown all over. Take out of the oven and EAT! Try sprinkling poppy seeds or sunflower seed for extra flavour and crunch. It finally snowed (yay!) and Mr. Weather finally gave us a day off of school. The only downside is the temperature feels like it’s dropped by a hundred degrees and I haven’t even been out to sledge or make a snowman! 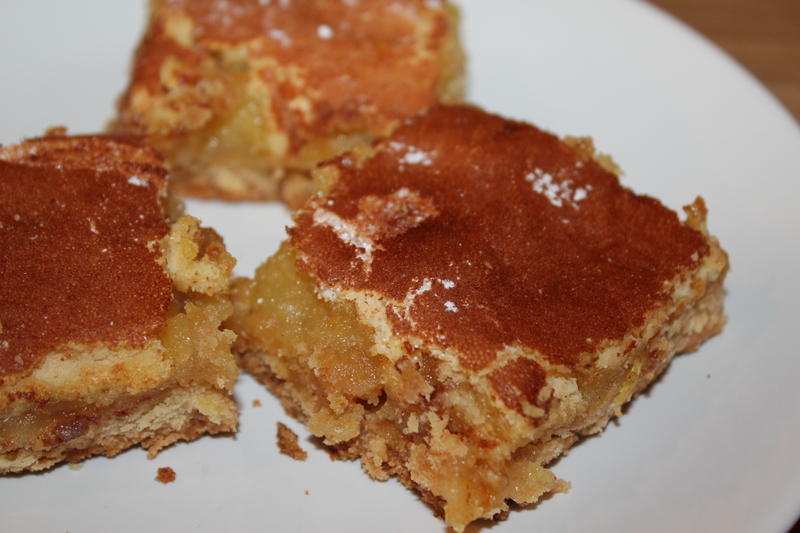 I made these bars and I think they are a simpler version of a lemon tart. They have a biscuit base instead of pastry and this is only on the bottom. Also, instead of using caster sugar the biscuit base uses icing sugar. The filling is a delicious lemon curd mixture, which sounds difficult but is actually really easy to make, and it has a yummy zingy flavour. 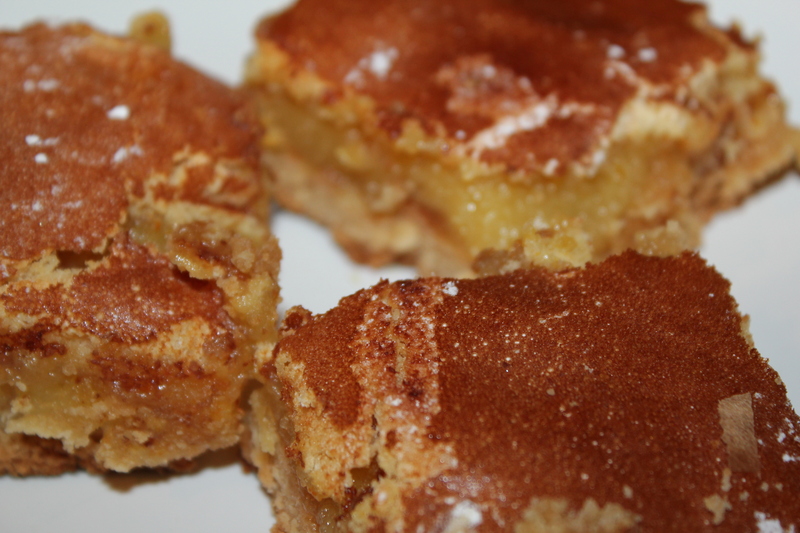 The texture of the lemon curd is thick and sticky when baked and should be slightly gooey when they are taken out of the oven. 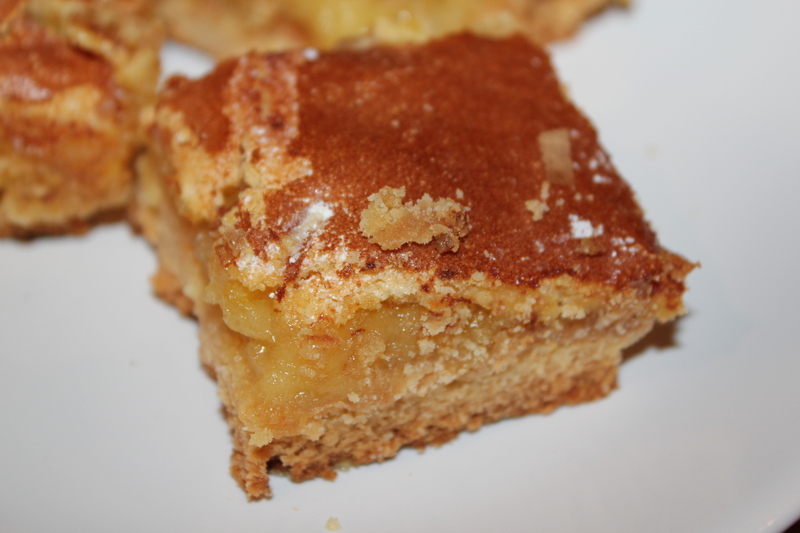 If I made these again I would use a bigger baking tray so that the bars came out thinner. These got the seal of approval from Little Elf who said it would go wonderfully with a cup of coffee (or tea if you prefer). Pre-heat the oven to 180 degrees celsius and grease the baking tin. Put all the ingredients for the base into a bowl and rub together so that it comes together in ball. Gently knead so that all the ingredients have combined. Put the base into the baking tin and press down so that the surface is even. Put this into the oven to bake for 10 minutes. Whilst the base is baking, crack the eggs into a bowl and whisk together with the sugar. Grate the zest of all the citrus fruits then juice them. You need 120ml of the fresh juices, I would juice the 2 lemons first then make it up with the orange juice. Add this to the egg and sugar mixture then add the flour and stir. Take the base out of the oven and put the topping on the top. Place this bake into the oven for 15-20 minutes or until the lemon curd has set. 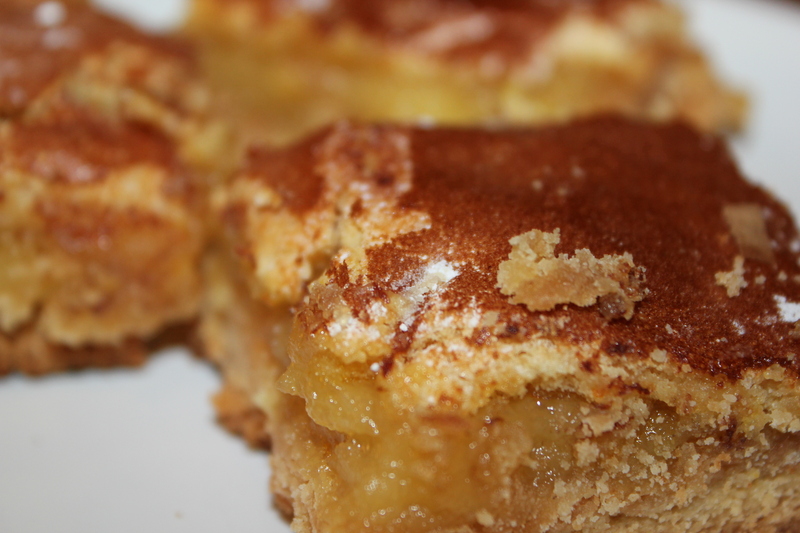 Take them out of the oven and cut into squares. Carefully get them out of the tin and put on a cooling rack. You can also dust with icing sugar! Guess what? It has SNOWED! Finally… I never thought it was going to happen but I am beyond excited that Mr. Weather has finally decided to hopefully give us a day off of school! However, the only problem is that this post is about raspberries which seems a bit inappropriate as it is sooo cold and raspberries are generally thought of as a summer fruit not a winter berry. The reason I decided to use them is because they have been defrosting in the bottom of the fridge for about a week so they had to be used. 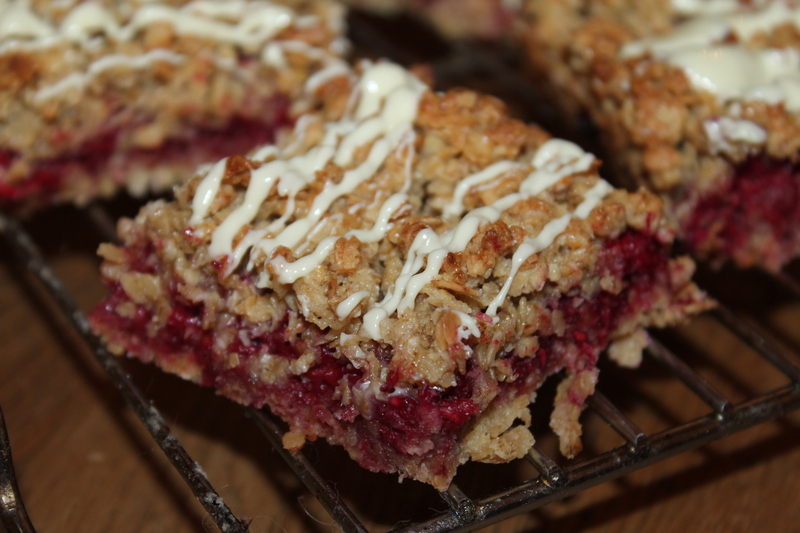 I made these flapjacks in DT Cooking when I was in Year 9 and they went down really well and I remember being really proud because it was the first proper recipe that I had thought up. 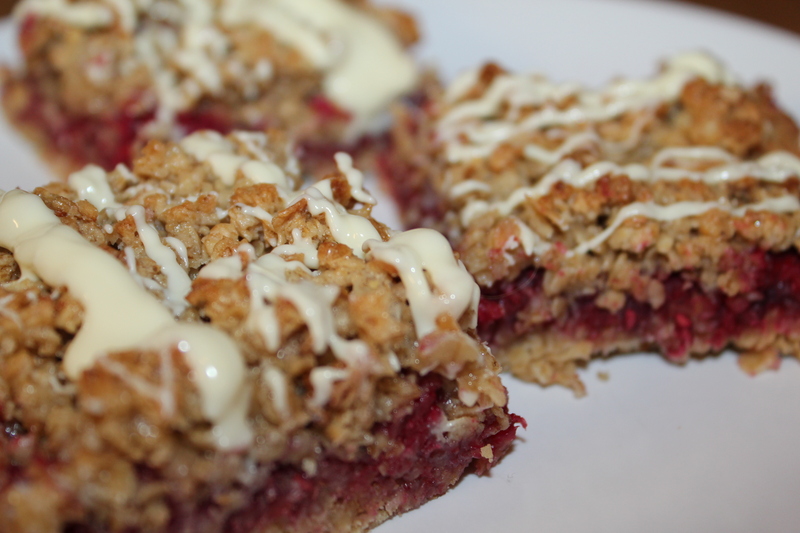 Flapjacks are really easy to make and the addition of the raspberries and white chocolate just look really impressive. 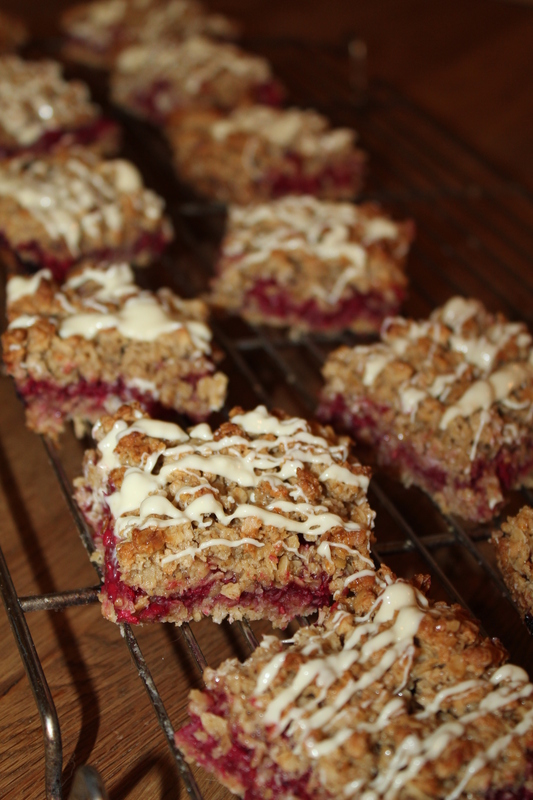 Because you put the raspberries in the middle of the flapjack mixture when you cut them open you get a wonderful pop of pink! 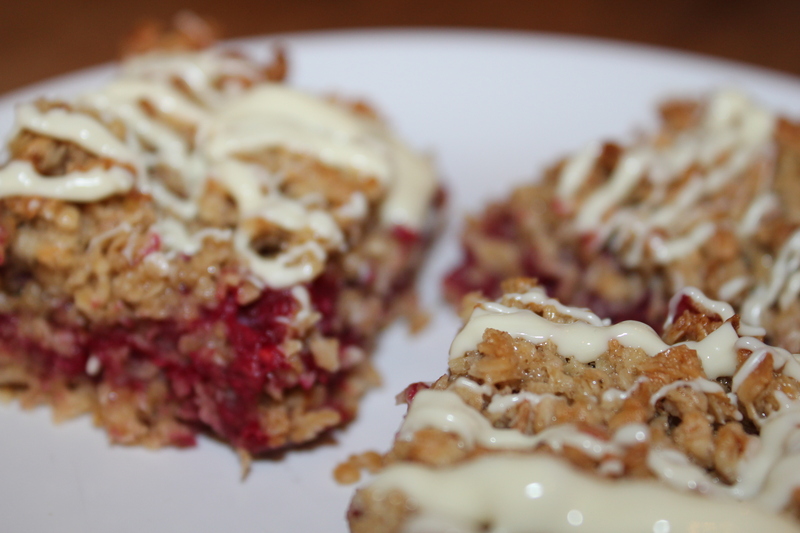 The tartness of the raspberries contrast deliciously with the gooeyness of the flapjack and the sweetness of the white chocolate. Pre-heat the oven to 180 degrees celsius and butter your baking tin. Then, melt the butter, sugar and golden syrup in a saucepan stirring continuously so the mixture doesn’t burn on the bottom. 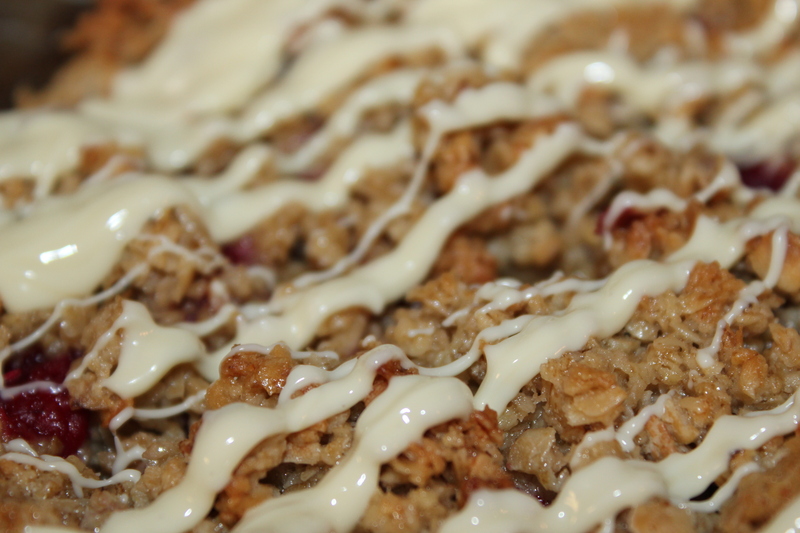 Take off the heat then add the oats and mix until everything is covered. 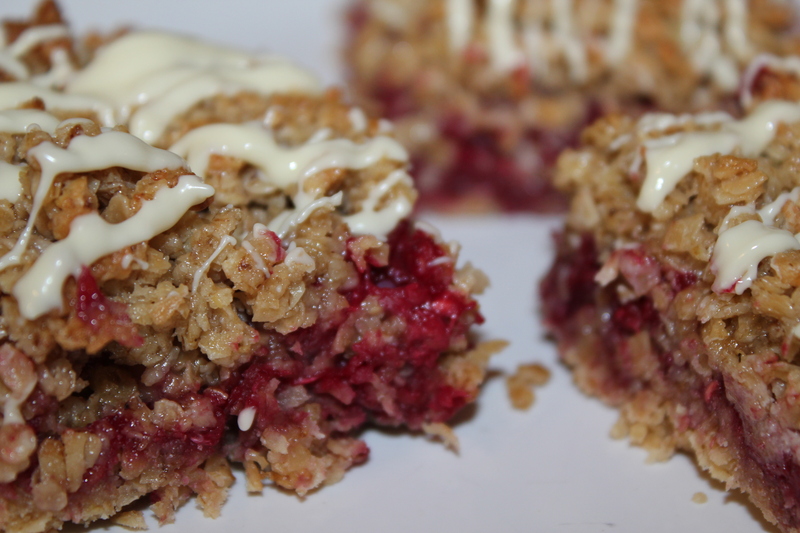 You may need to add some more oats so it’s not too runny. 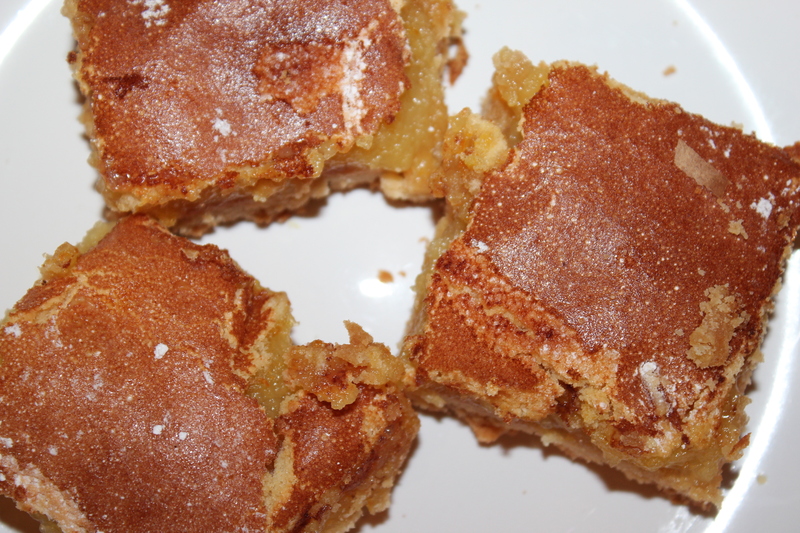 Pour half the mixture into your baking tin and spread evenly then drizzle some golden syrup over top. Bake for 10 minutes. 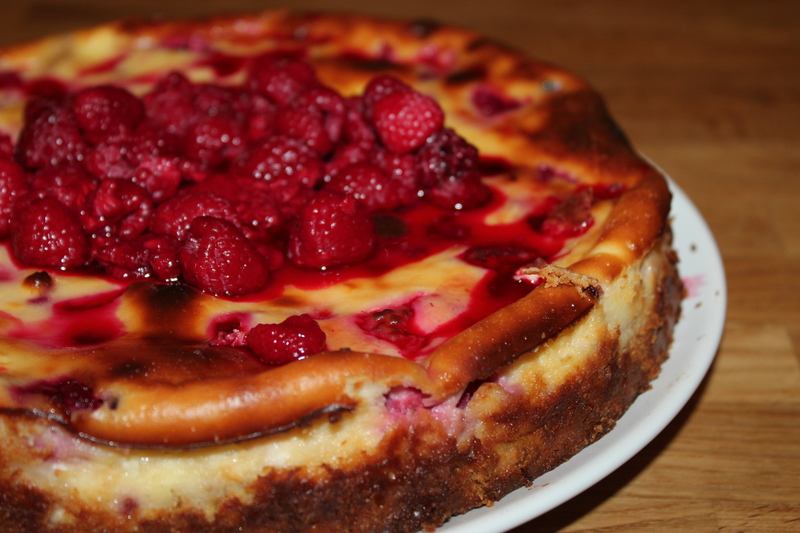 Whilst this is baking crush your raspberries then drain 3/4 of the juice out. 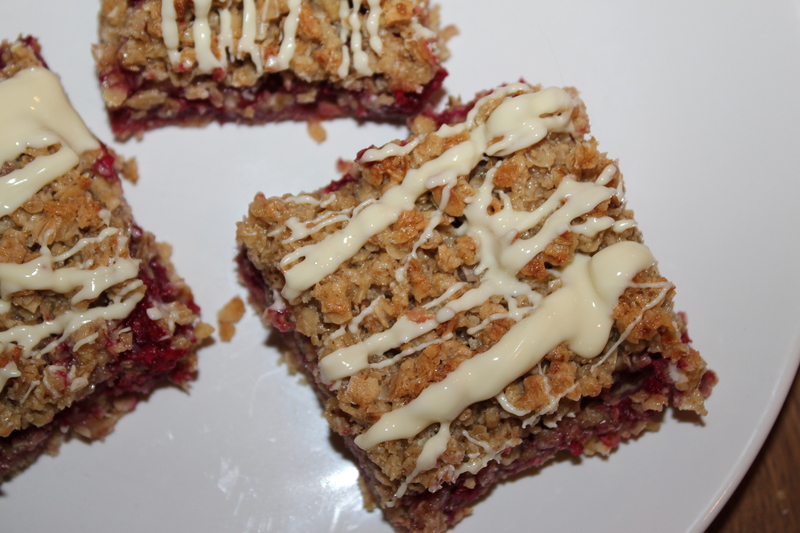 Take out the flapjack from the oven and tip the raspberries onto the base and spread evenly then tip the other half of the flapjack onto the top and spread. Put in the oven and bake for 25 minutes or until golden brown on top. 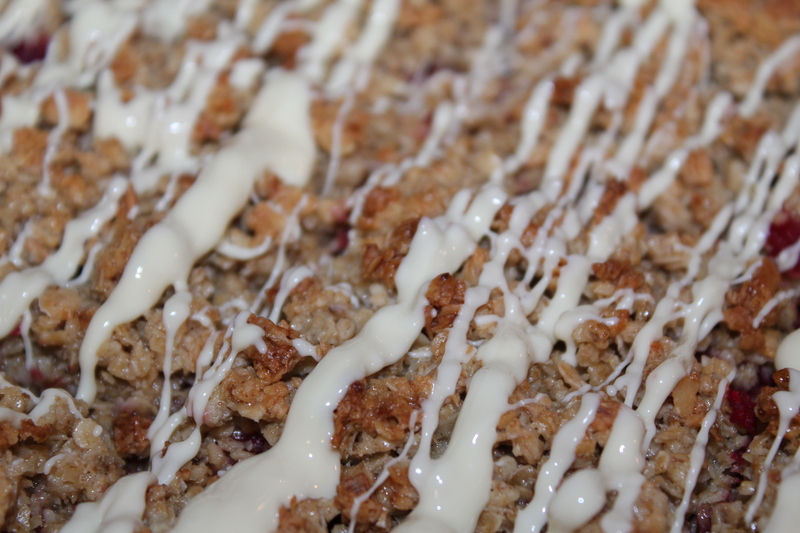 Make a bain-marie and melt the white chocolate and when the flapjacks have baked drizzle over the top. 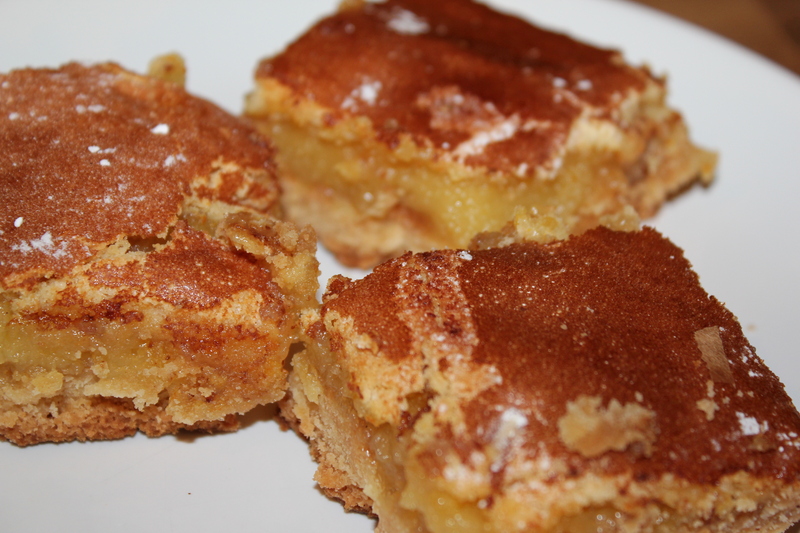 Cut into squares then get them out of the baking tin and leave to cool on a cooling rack. I got them out of the baking tin using a spoon! You could also try blueberries, cherries or strawberries in the middle! So that lasted long… not. It always happens. Every year I make a resolution to be extremely healthy. 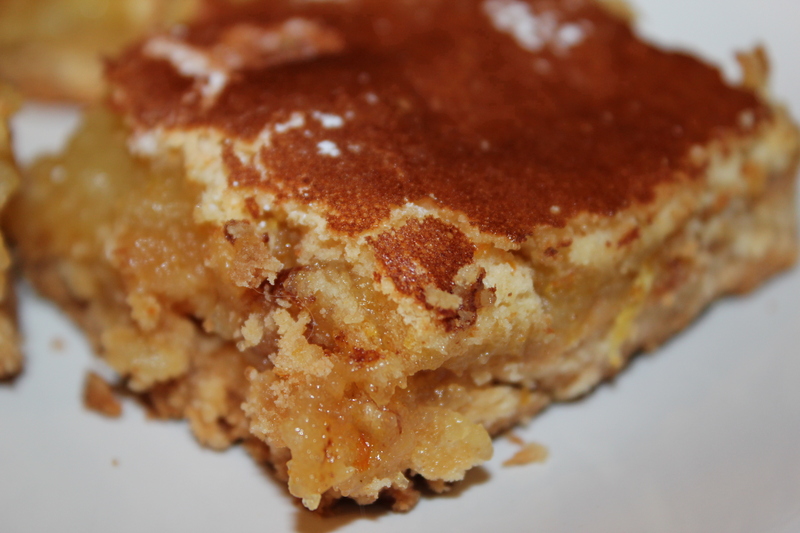 Then I find a delicious recipe like this and my will-power evaporates! 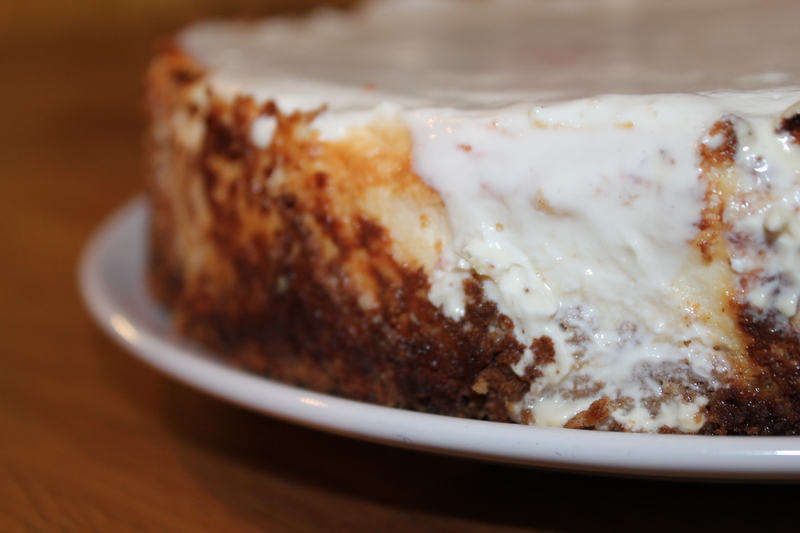 I love cheesecake? Have I mentioned that before? It’s just the the creamy topping juxtaposed with the crumbly buttery biscuit which is just heaven (or obesity, whichever you prefer!) on a plate. However I was determined that the person I was giving this one to wouldn’t be disappointed with a ‘flan’ but pleasantly surprised. 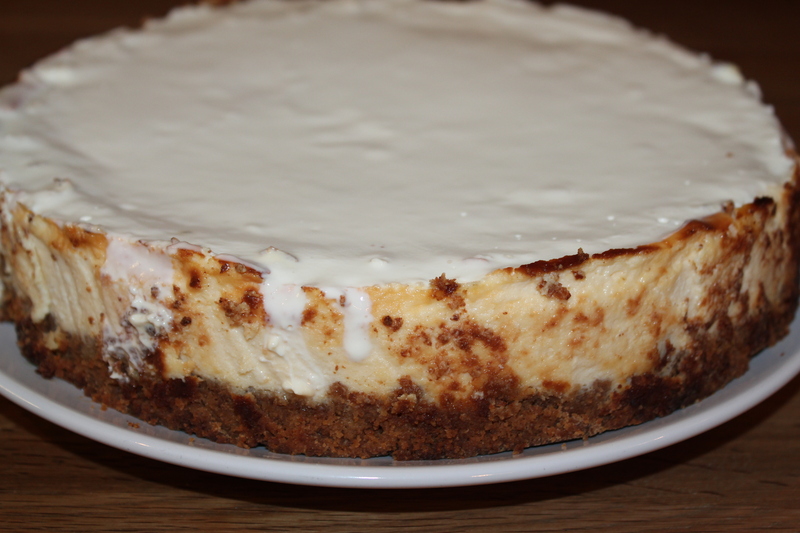 In the recipe I used they had a sour cream topping which I thought sounded disgusting. Sour Cream? It just doesn’t give a nice mental picture but in actual fact it was delicious. 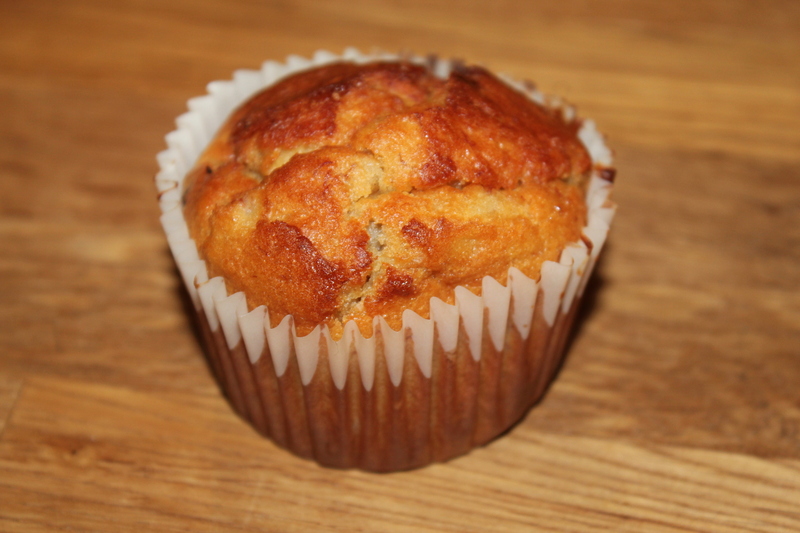 I found this recipe on BBC Good Food which I have to say is one of my favourite places for finding recipes. It just has one for every occasion! Preheat the oven to 160 degrees celsius. Boil the kettle and make a bain-marie. Melt the butter, gently stirring. 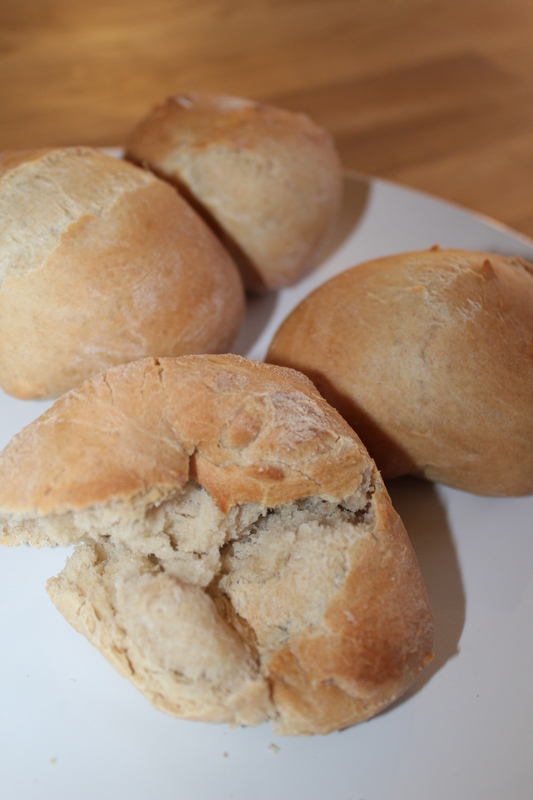 Put the biscuits into a sandwich bag, wrap in a tea towel (just in case the sandwich bag bursts, to avoid this make sure there is no air inside it before you tie it closed) then bash with a rolling pin until the biscuits resemble crumbs. Add this to the melted butter with the caster sugar, then mix together until everything is covered (I dare you to resist this buttery biscuit delicousness). 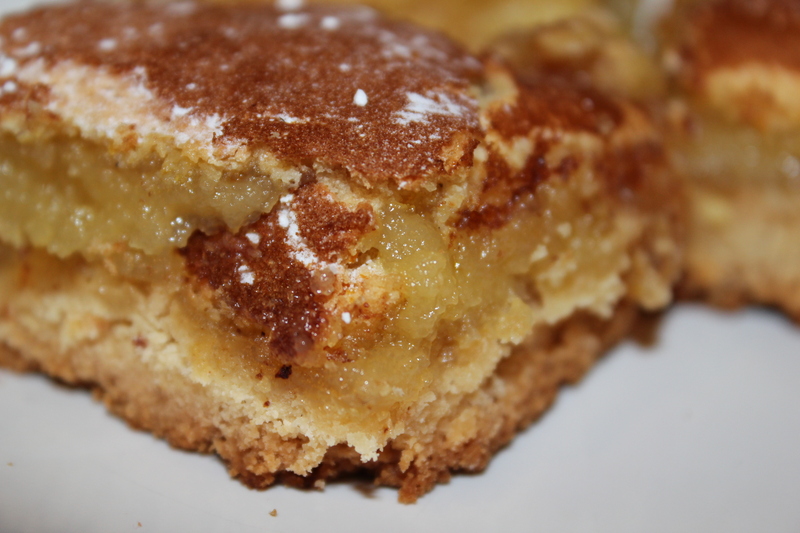 Then tip into your baking tin a press down with a fork. Put this into the oven for 10 minutes whilst you make the filling. After you’ve taken the base out of the oven increase the temperature of the oven to 200 degrees celsius. 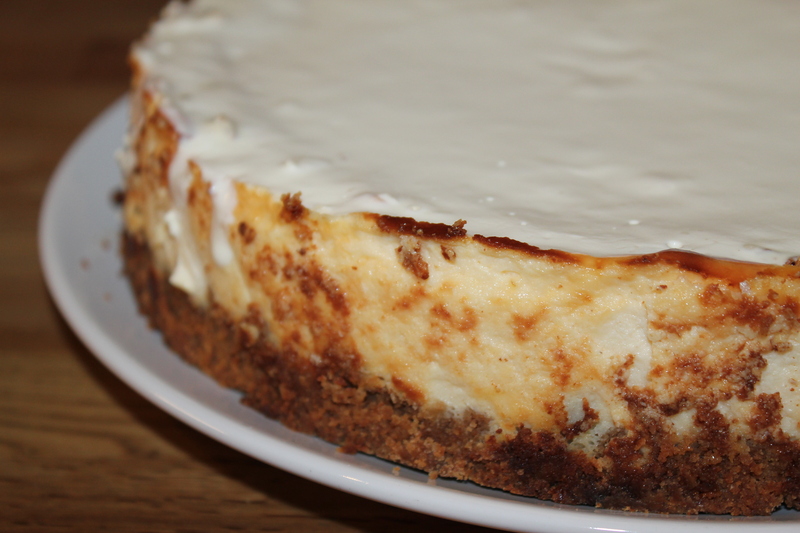 For the filling, put the cream cheese into a bowl and beat until creamy, then add the sugar. Next put in the soured cream and eggs and beat until everything has mixed. Finally add everything else and whisk until the mixture is creamy and smooth. Pour on top of the biscuit base then bake for 10 minutes at 200 degrees celsius. Then lower the oven temperature 90 degrees celsius and continue to bake for 25 minutes. 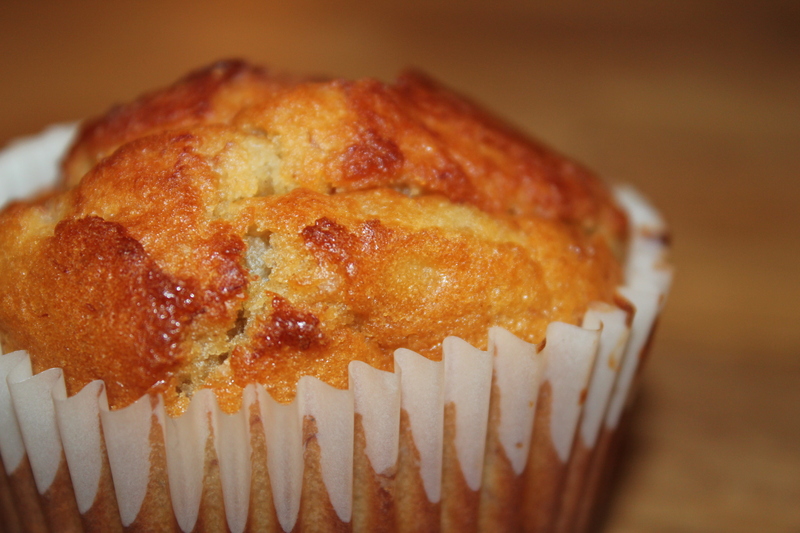 You know it’s ready when you shake the tin and the filling wobbles a little in the centre. 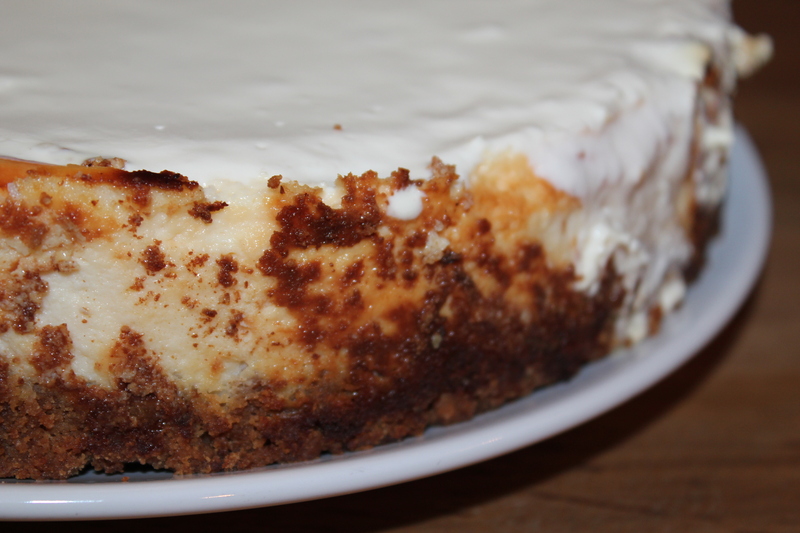 Take the cheesecake out of the oven and leave to cool for a couple of hours. To make the topping, simply put all the ingredients into the bowl and stir together. 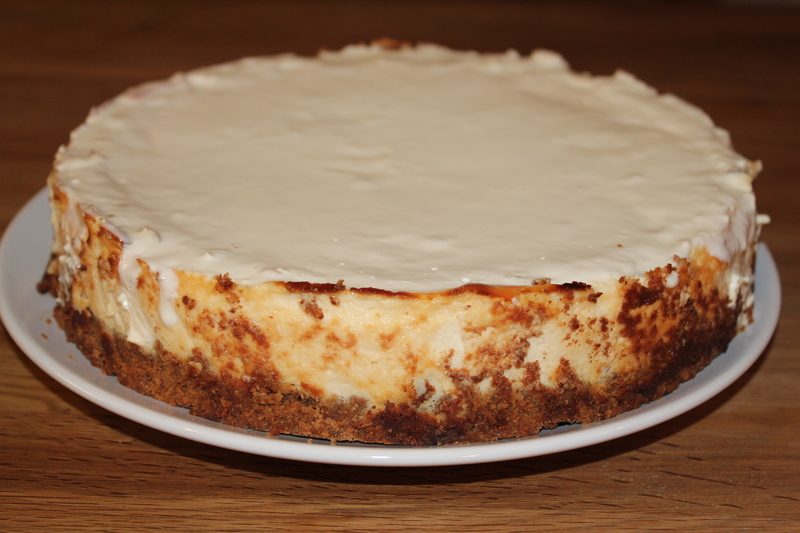 When the cheesecake has cooled at room temperature for 2 hours tip the topping onto it and then refrigerate for 8 hours or overnight. After Christmas we always have food left over. This year we had bananas left over. However they were extremely over ripe and even the adults (who claim this is the best way to eat bananas) didn’t want to eat them. 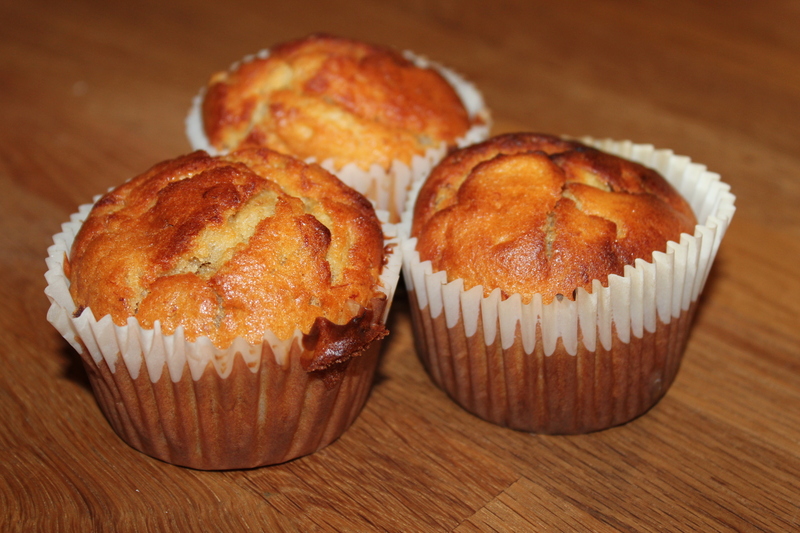 So, that got me thinking, what can you do with over ripe, browning bananas? Stick them in muffins of course! 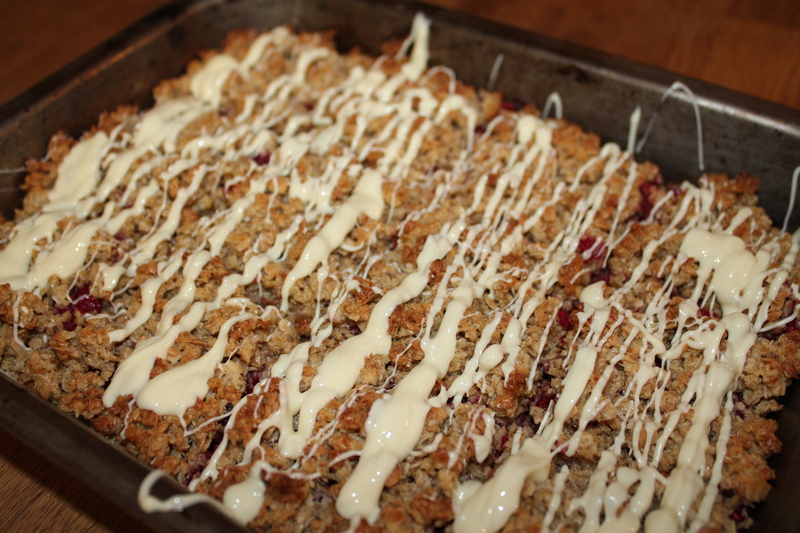 This a very simple recipe which only takes about 1 hour to complete (including baking time) which is perfect for when you want a treat which isn’t going to break any of those new years resolutions! Especially after the over indulgence of Christmas! 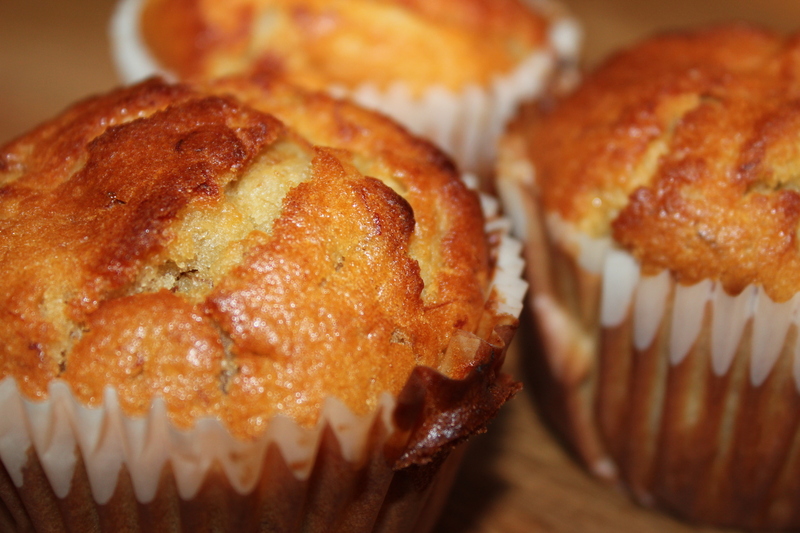 Bananas are a good source of carbohydrates so they are perfect for breakfast as they keep you going through until lunch. 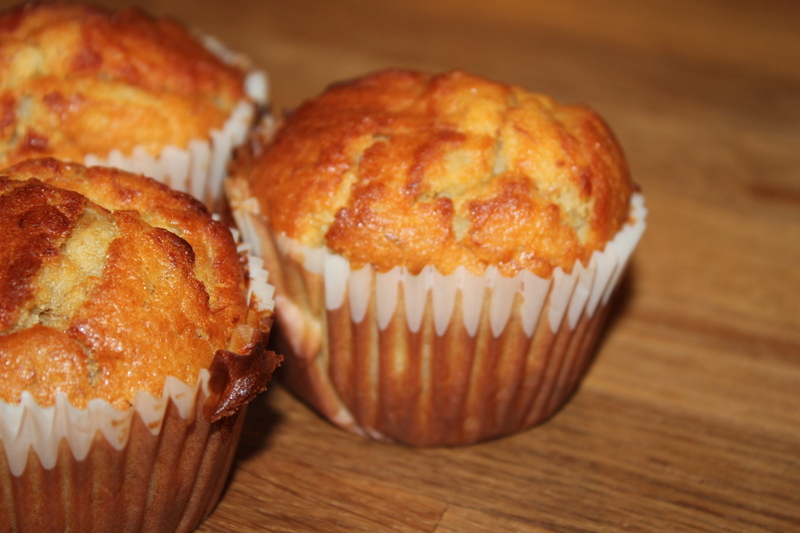 The muffins have a fluffy texture and they are light so don’t leave you feeling bloated. 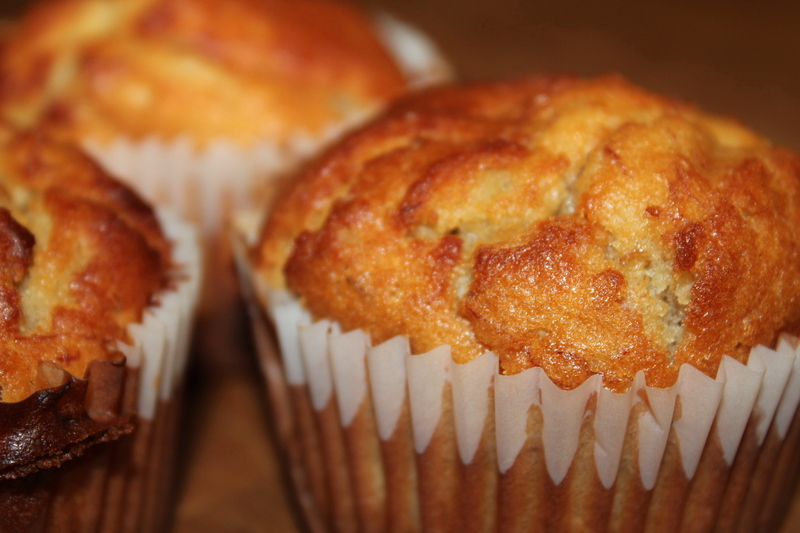 Pre-heat the oven to 180 degrees celsius and line a muffin tray with muffin cases. Get a bowl and whisk together the eggs, vegetable oil and milk. Add the sugar and whisk until everything has combined. Sift in the self-raising flour and whisk so that the mixture is nearly smooth. 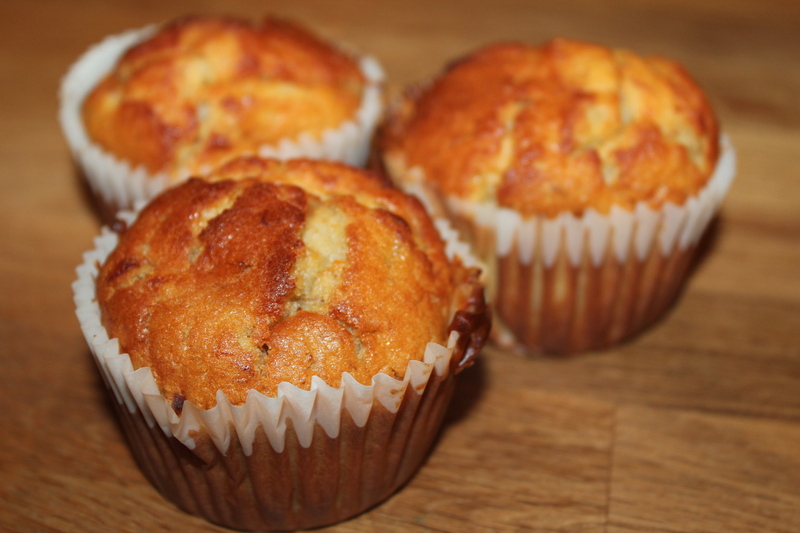 Mush up the bananas and stir them into the muffin mixture until evenly substituted then mix in the golden syrup. 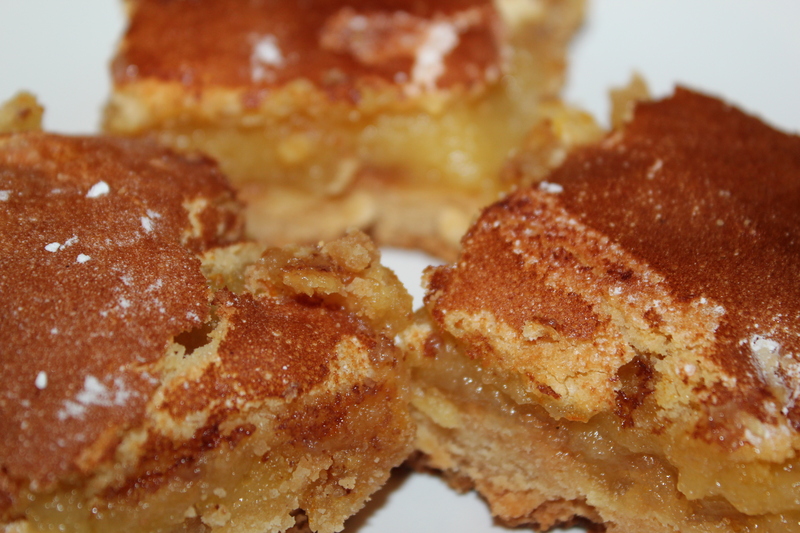 For even more flavour add a tablespoon of nutmeg and cinnamon. 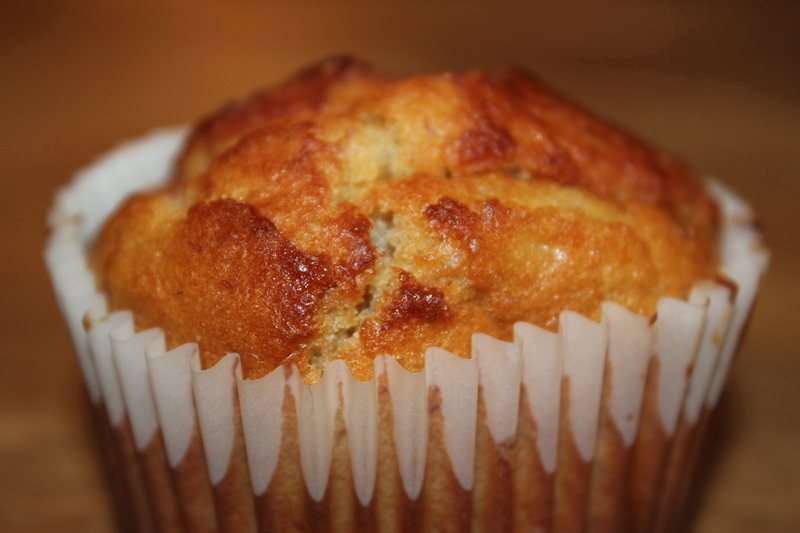 Or, for an even breakfastier feel substitute 50g of oats in and only use 350g self-raising flour. Happy (belated) New Year! And what a good new year this is hopefully going to be. 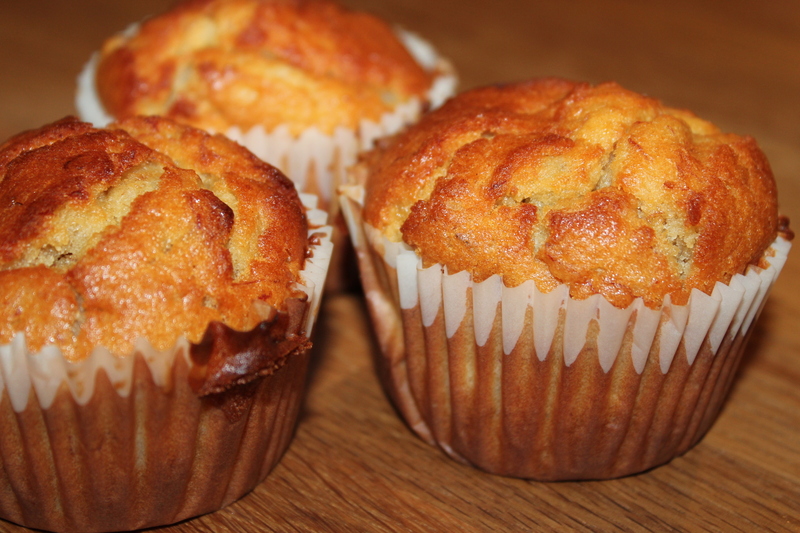 So, I haven’t actually baked anything in 2013 yet! 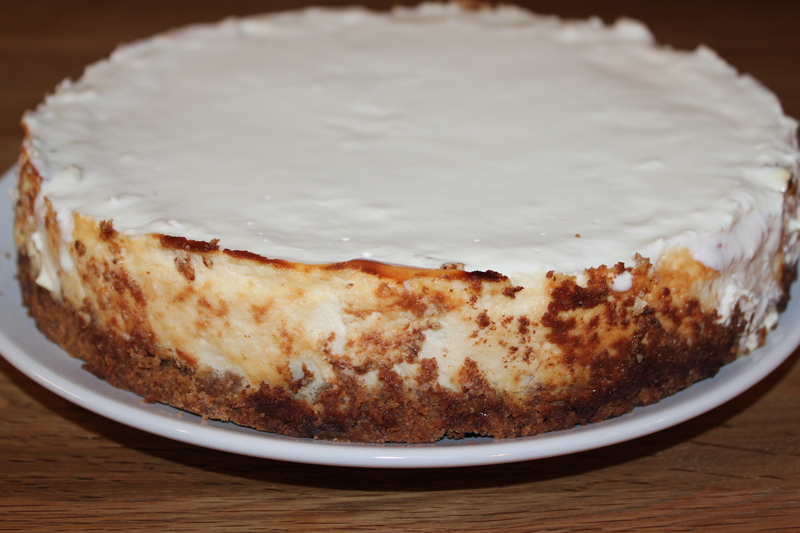 This lovely, creamy cheesecake was made on the 31st December 2012 to welcome in the new year (not hat there is any left!). 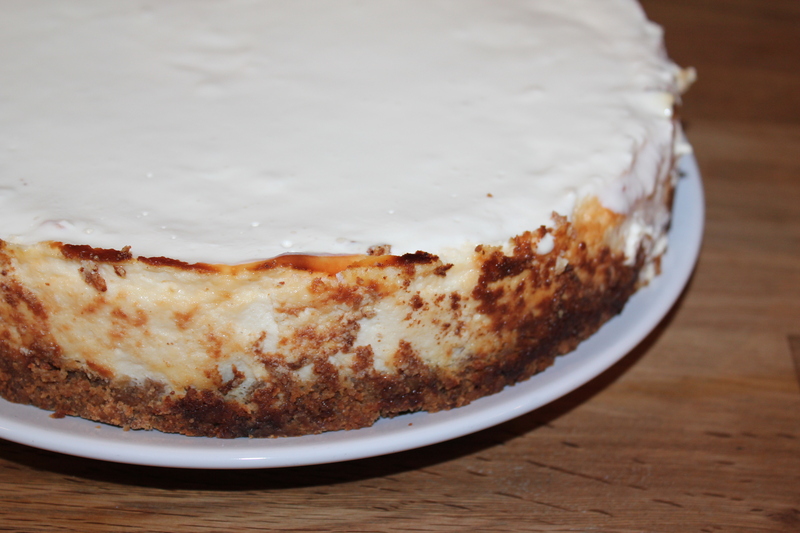 You may of looked at the title of this post and wondered what a baked cheesecake is. 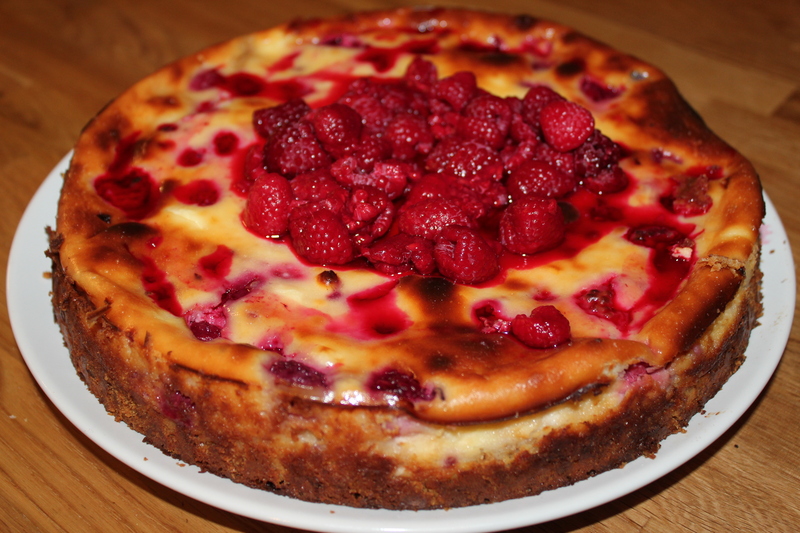 Basically, it’s a normal cheesecake which you just bake in the oven instead of leaving to set in the fridge. 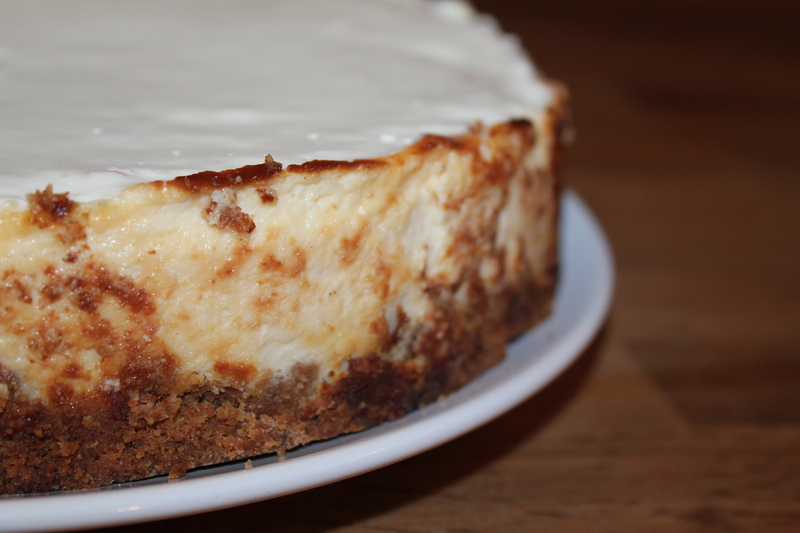 You still use all the usual ingredients you’d expect to find in a cheesecake: soured cream, cream cheese and sugar. In this recipe which I found on BBC Good Food it says to only use 8 digestive biscuits However, I’ve made this before and decided that there wasn’t enough of a base so I used about 11 biscuits. You just bung it in the oven for 40 minutes instead of the fridge! Pre-heat the oven to 180 degrees celsius. Make a bain-marie and put in the butter. Melt, stirring continuously then take off the heat. Put the biscuits into a sandwich bag, wrap in a tea towel then bang with a rolling pin (it helps to imagine someone that you don’t like!) and hit until the biscuits resemble crumbs. You can leave some bigger chunks as they add extra crunch. add to the butter and stir until all the biscuits have been covered in the butter. Tip into your baking tin and press down so that they compact together. 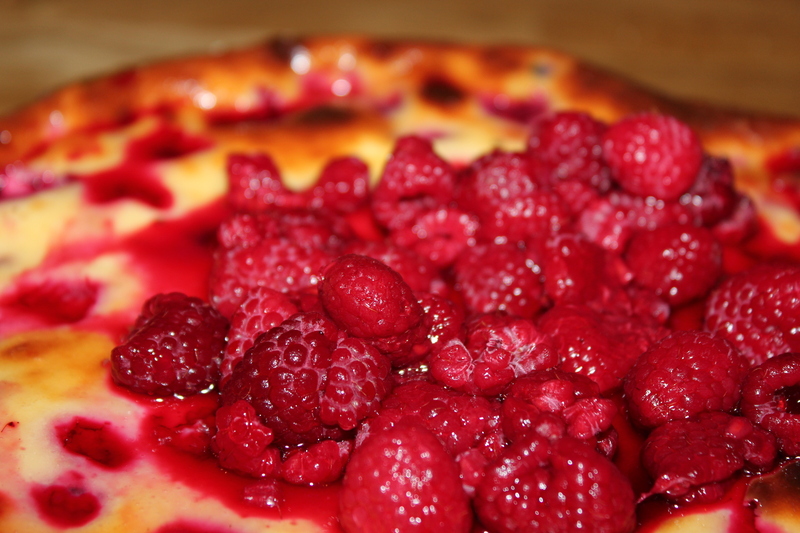 In a separate bowl put all the other ingredients (not the raspberries) and stir so it’s smooth. 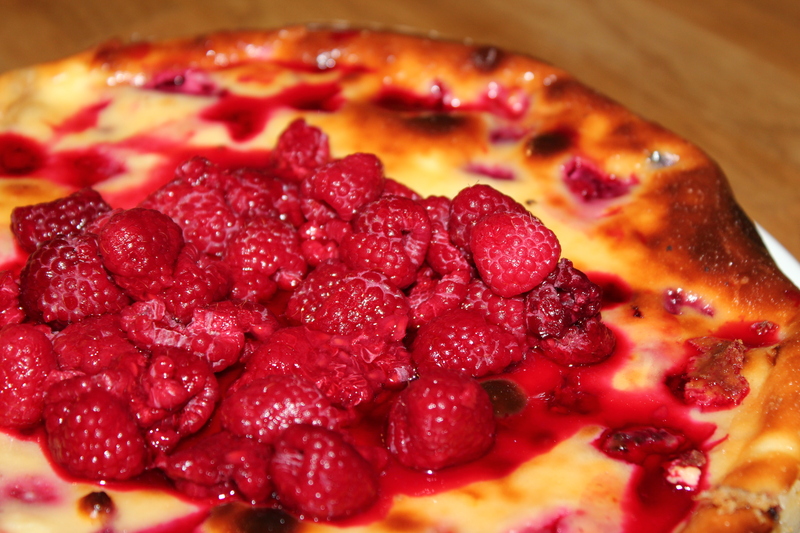 Add 150g raspberries and mix them gently into the mixture so they don’t break up. 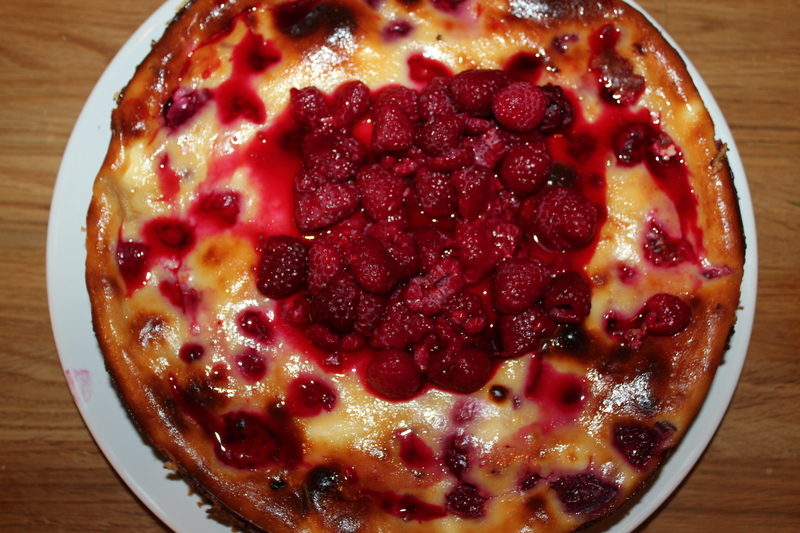 Put the other 150g raspberries in a saucepan with the icing sugar and heat gently for 3 minutes. 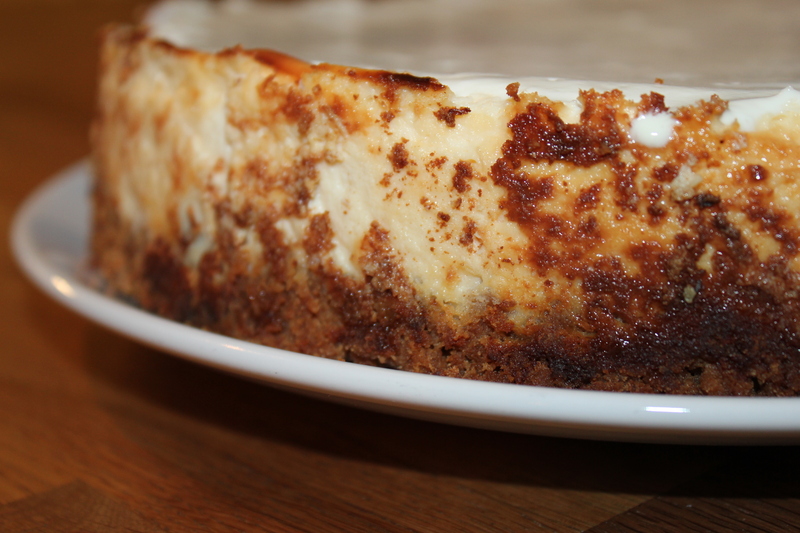 Pour into the mixture then tip over the biscuit base (the buttery biscuit base!). Place in the oven for 40 minutes. It should be set and slightly wobbly in the middle. Take out of the oven and place on a cooling rack. 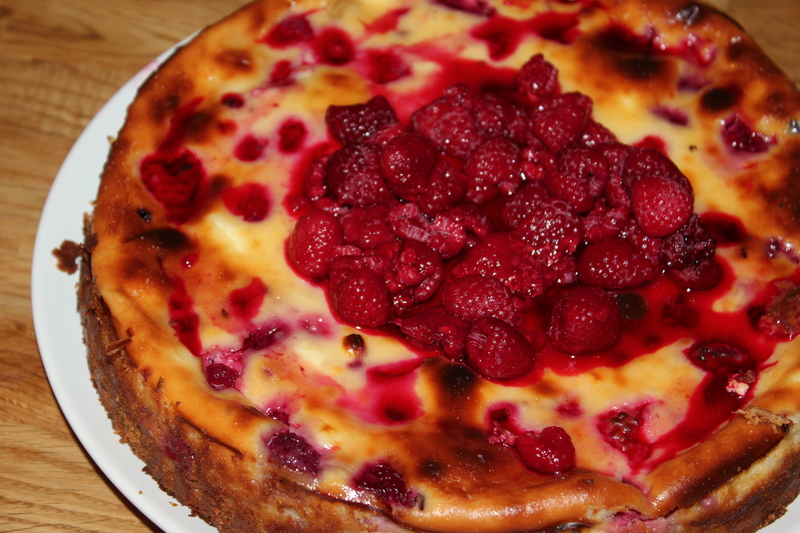 When you are ready to serve put some raspberries on top. I think this would be equally nice with other biscuits such as ginger nuts or shortbread.